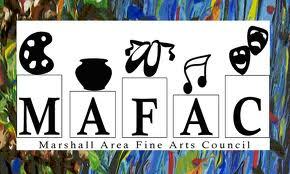 MAFAC is a non-profit organization dedicated to promoting the arts in the Marshall Area. It provides art exhibits and a gift shop at the Arts Center "under the purple awning" on 3rd Street. In addition, a concert series featuring professional musicians is promoted yearly. The program will be presented by Judy Skogen, Gift Shop Coordinator and Carol Purrington, co-president of the Board. Please RSVP by Tuesday, April 10th.